A large country house sleeping up to 18 people with 9 bedrooms, 5 bathrooms. Among the main bedrooms there are three bedrooms with fixed double/king sized beds and the remainder can be either configured as twins or king sized double beds. The attic rooms are ideal for teenagers/children and have 2 single beds in each room. One with TV and their own bathroom. The kitchen is an old style country kitchen with aga and additional electric cooker. microwave, 2 fridges/freezers and fully equipped for up to 18 guests. There is seating for 8 around the kitchen table. The Dining Room can seat up to 18 people. The main table seats 12/14 and an additional table can seat 4/6. The garden has beautiful views down to the River Tweed and there is ample garden furniture a Bar-B-Q and a lawn that can be used for croquet and outside games. PLEASE NOTE THE PRICE FOR 2 OR 3 NIGHTS IS THE SAME AND FURTHER DISCOUNT AVAILABLE FOR 4 NIGHTS OR MORE. PLEASE ENQUIRE BEFORE YOU BOOK. Howford House is on the Traquair Estate and was originally built for the factor or estate manager. I live in Traquair House and my family have been here for over 500 years and Traquair is Scotland's Oldest Inhabited House. We have three children and we run the main house as a visitor attraction and with some limited accommodation. In 2015 a long standing tenant vacated Howford House and we decided to renovate the property for self catering. We have kept a relaxed informal country house style with many items of furniture and paintings being lent from the main house. We have an eclectic mix of art both contemporary and traditional. Mattresses and bedding are all new and excellent quality and the bathrooms have been renovated as well. The estate comprises around 4.500 acres and includes four farms which mainly farm sheep and cattle which you will see around the house. There is also a large number of forests and the River Tweed which offers fly fishing during the winter and Spring months as well as trout fishing in the summer. Howford is a perfect retreat for family and friends. It has a country house elegance that I love with a relaxed feel which we have tried to keep as much as possible. Lots of space and the rooms are all generously proportioned with wonderful views. There are wonderful stone flagged floors that have been retained and makes this a robust house you can enjoy without worrying about bringing in a bit of mud now and again! It is also very accessible from Edinburgh with good facilites in local towns nearby. Perfect in the winter for cosying up around the open log fire and going for long walks or relaxing in summer with the beautiful garden and space to enjoy the outdoors. Gorgeous views, spacious, relaxed, well appointed house that is perfect for large groups of friends or family. It has the additional features of a fully accessible bedroom on the ground floor that was previously converted for a wheel chair user with accessible shower/wet room. Also, the attic rooms are just great for teenagers or kids as they have a self contained mini flat with their own bathroom and TV! Aga, electric hob and oven, microwave, fridge/freezer toaster, fully equipped with all utensils, crockery, glasses etc. Spacious and private garden. Steep sloping lawn that levels out with room to play games. Wooded area at back of house. Entire garden surrounded by high beech hedge. Lovely view.s towards river Tweed. Can be hired at Glentress Forest Park approx 3 miles. The Ground Floor bedroom is fully accesible and has an accessible wet room. There is access by wheelchair from the ground floow bedroom to all ground floor areas. Very comfortable accommodation for a large group of all ages. Lovely family weekend to celebrate a milestone birthday. Welcoming and relaxed. Everyone had a great time exploring the area in the Spring sunshine. 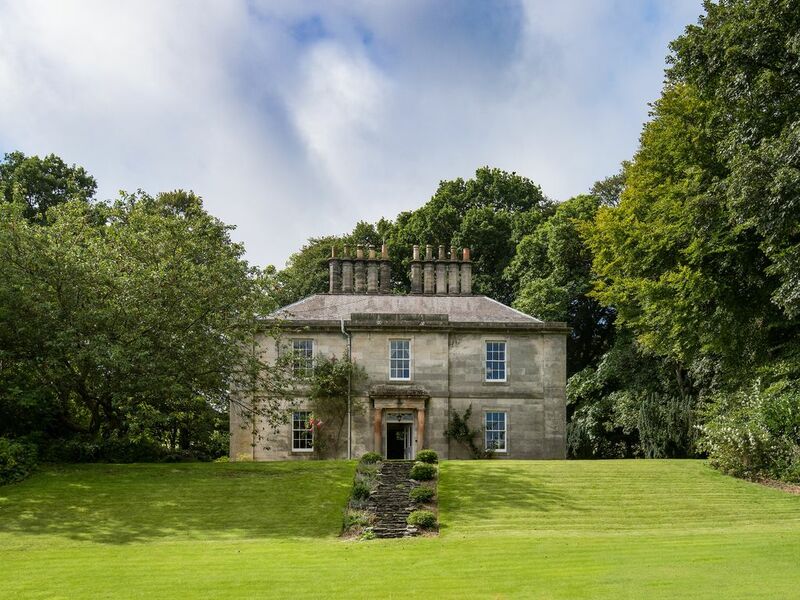 Howford House is set in the heart of the Scottish Borders and just 10 minutes from Traquair, Scotland's Oldest Inhabited House and 5 star visitor attraction. As Howford is amnaged by Traquair Estate guests staying at Howford are free to use the extensive grounds, tennis court etc as well as enjoy discounted entry to the house and banquet/dinners offered in the eighteenth century Dining Room. Please see www.traquair.co.uk for more details. The Scottish Borders is rich in history and culture, beautiful landscapes, rolling hills, rivers and lochs with the additional advantage of being a relatively little visited part of Scotland. Superb walking and cycling including some of the best mountain biking in Scotland. There a number of historic local towns to visit, attractions such as the ancient Border Abbeys, Abbotsford- Home of Sir Walter Scott and gardens such as Dawyck Botanical garden and Kailzie gardens just three miles away. The summer months host a large number of local festivals and events including the Border Common Ridings where local inhabitants have a mass ride out on horseback to celebrate the riding of the boundaries that has take place over many centuries.